An in-depth and personal conversation revealed a prospect’s service during the Korean War, what many call the “forgotten war”. The prospect’s service was obviously a key part of his story and legacy. 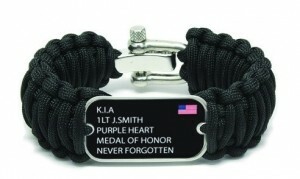 The sales person visited www.survivalstraps.com, purchased a bracelet commemorating service in the Korean War and sent it to the prospect. The prospect called the community immediately after he received it to thank the sales person and tell her he was going to show it off to his friends and war buddies. The sales person not only demonstrated that she had listened to the prospect, but that she knew the prospect’s war service was an important part of his legacy.